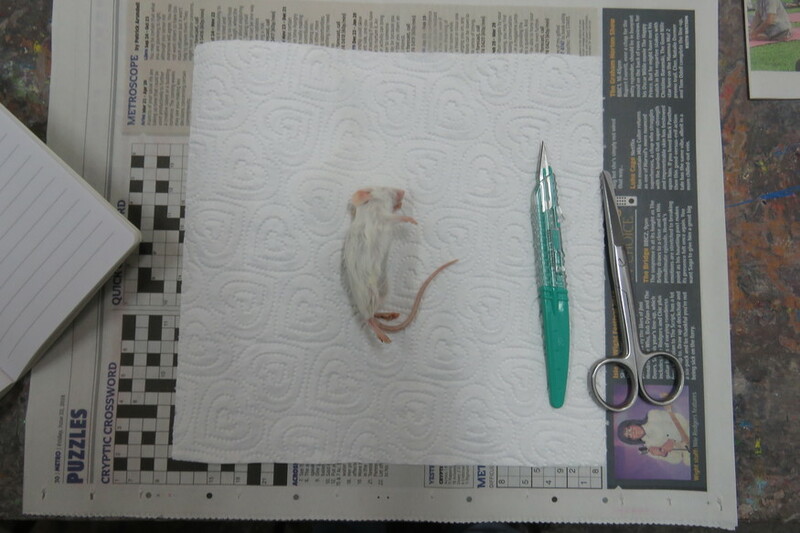 Warning: article contains some rather gruesome images of dead mice. The Natural History Museum is not the only place in London to get your fill of taxidermy specimens. Although the exterior of Islington Arts Factory isn't quite as grand as the museum’s spectacular Victorian-era edifice, an equally inspiring afternoon awaits within. Also: those stuffed creatures in the hallowed exhibition halls of South Kensington don’t tend to bear clothing and canes. These ones do. You can't over-emphasis the Victorians' obsession with death. And it wasn't just down to the passing of the queen's beloved Prince Albert. The period's fascination with the macabre pre-dates his early demise (at the age of 42) by several years. So fashionable did the celebration of death become that ordinary families started immortalising their deceased pets, contributing to the growing taxidermy industry. One of the foremost exponents of the art was Walter Potter. 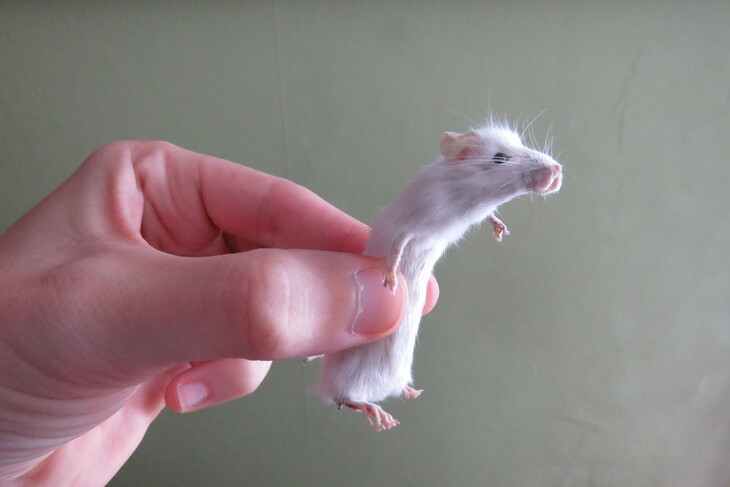 He's often cited as having popularised — if not created — the whimsy of anthropomorphic taxidermy (that is, positioning animals into human poses and dioramas). Something of a 19th century Damien Hirst (Hirst in fact tried to buy Potter's collection for £1m in 2003), his most famous tableau is probably a 34-animal guinea pig cricket match. Following in Potter’s wake was the German, Hermann Plouquet, one of 14 taxidermists displaying their 'drolleries' at the Crystal Palace Great Exhibition of 1851. Victoria, famed for not being easily amused, wrote privately of the ice-skating hedgehogs and duelling dormice as being a "really marvellous" scene after visiting for herself. Fast forward 170 years. 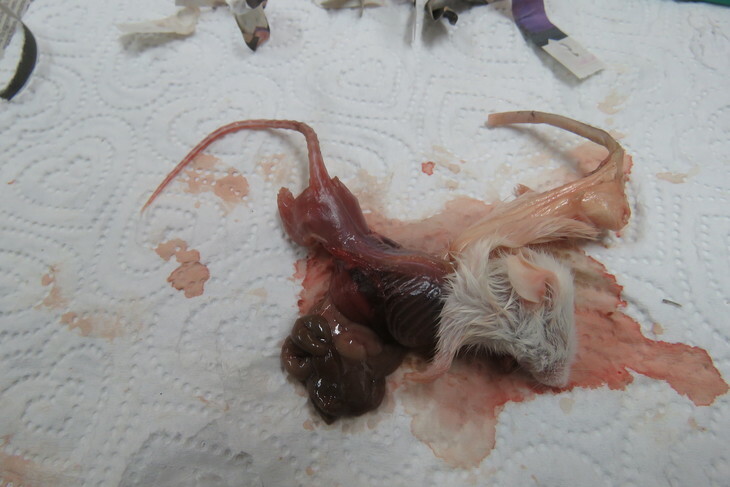 The exotic pet trade produces an excess stock of small mammals intended for the stomachs of snakes and lizards. 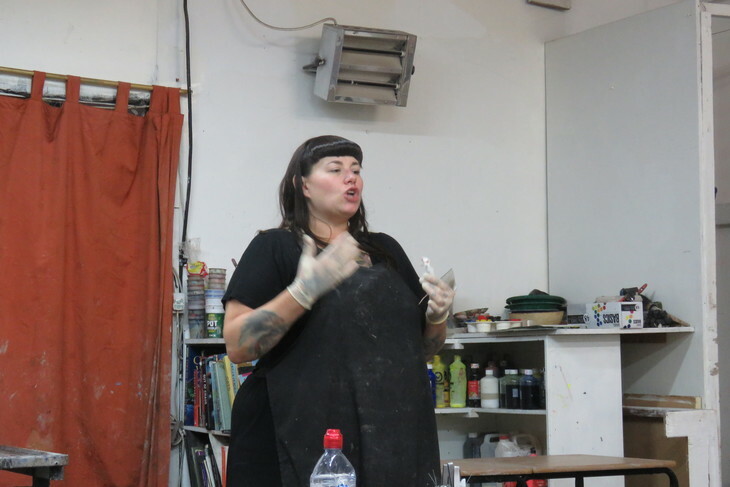 Tonja Grung of the British Academy of Taxidermy (a division of the Last Tuesday Society, a bastion of the London weird and wonderful), takes the undigested creatures off their hands. It's recycling, if in rather a niche way. 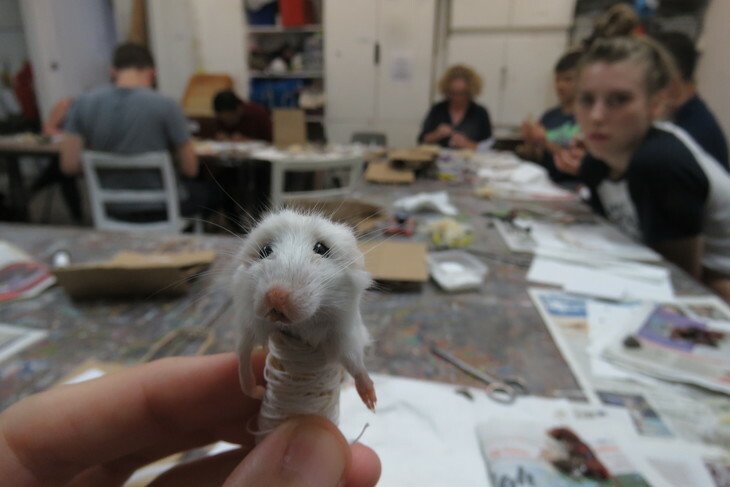 Over the years, South African-born Tonja has taught thousands of Londoners the secrets of anthropomorphic taxidermy from the slightly battered community space within the converted church of Islington Arts Factory. 16 of us, including three pre-teens, earnestly sit in front of small, slightly damp, white mice set on sheets of kitchen roll, amid a bank of hairdryers (a vital piece of kit it turns out) and the glazed clay works from an earlier children's pottery class. The sound of a dance session rumbles somewhere overhead. Our first job is to carefully manipulate the minute forelegs ('arms' to us beginners) and the hind legs of the still-frozen carcasses to make them supple enough to begin working on. Tonja checks we're not going wrong already. "Are you shaking?" she asks as I wield a scalpel for the first time to slit open the stomach. "It’s just a lack of caffeine, I promise" I reply. But the truth is, it's pretty nerve-wracking. With a body no bigger than my thumb, it would be superbly easy to slip up as we begin the process of separating the all-important skin from its innards in a series of operations (an apt word) that make perfect sense once you've done them, but almost none before then. 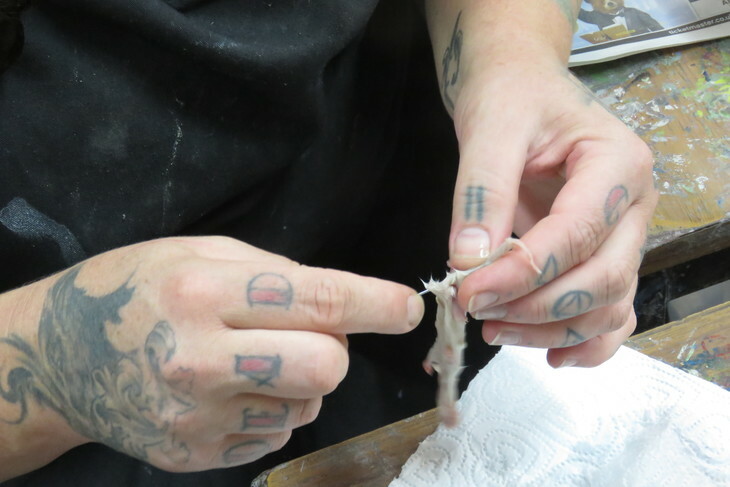 The process of taking the tail out of its long sheath of naked skin is particularly intricate and time-consuming. In all, it's about two hours work for the uninitiated. "You guys are quick" says Tonja, before admitting that with a decade of experience behind her she can do the same job in 10 minutes. A little bloodied, the skin doesn’t look much until it's given a quick wash and blow-dry at the bank of hairdryers. Then, laid flat on the kitchen towel, it looks a bit like a tiny bear-skin rug, the paws (but not skull) still in place, and feels as soft as the finest velvet. The empty head fits over my little finger perfectly. 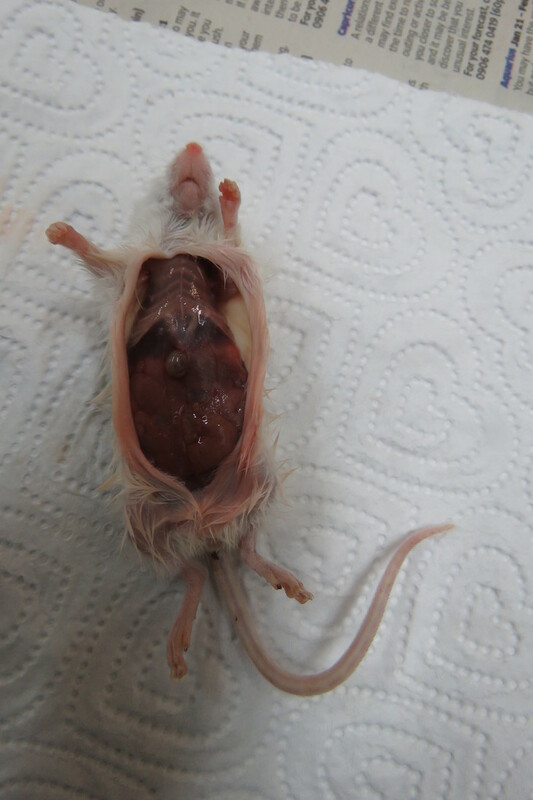 Now comes the hard bit — reforming a flaccid mouse pelt into something that reasonably resembles the animal it came from. This entails a lot of quizzical looks, a touch of the antiseptic powder borax (the only chemical we come into contact with), and a great deal more patience than I normally possess. Eventually we're able to slip the pelt onto a bound sausage of wood wool and clay, splay the arms and legs apart with wire, slot in some fake eyes and try to make it all look as natural as possible. Finally comes the stitching up of the stomach, like doing up the zip on a onesie. Satisfyingly, the hidden stitch we use makes it all but impossible to see where I had made the long incision at the beginning of the afternoon. 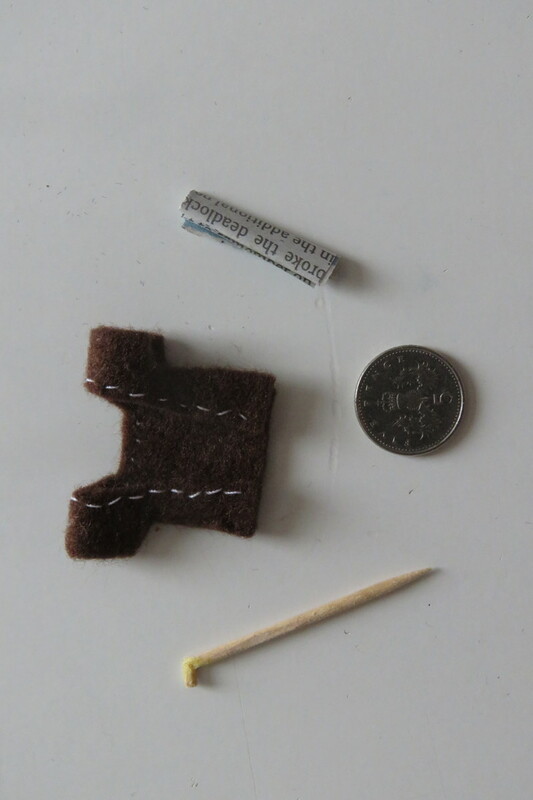 Tacked to a piece of board with dressmakers pins, I slip my mouse into a brown paper bag. It has to dry over the next few days. The ears are the first to harden, followed by the tail, paws, and finally the torso. 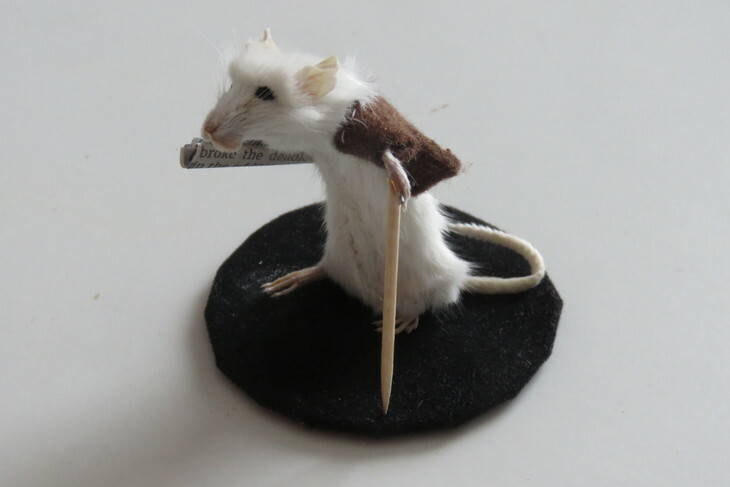 At this point, back at home, I'm able to add a home-made waistcoat, cane and newspaper, to turn my mouse into a suitable memorial to Walter Potter, and those like Tonja who are keeping his unique craft alive. 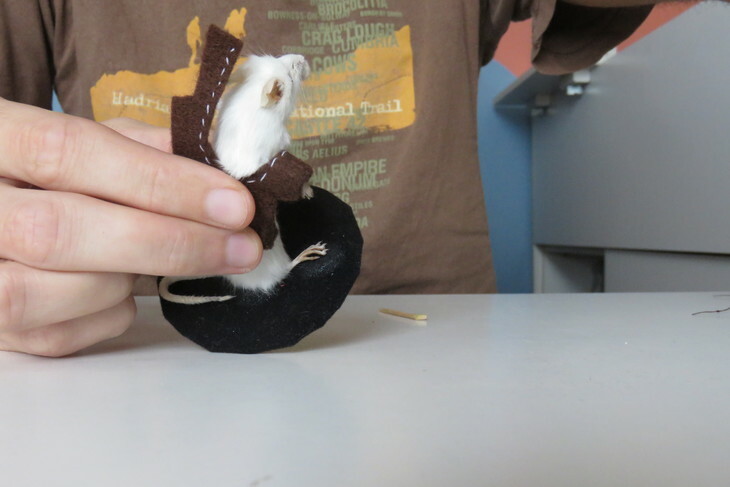 Classes are scheduled to last four hours (ours took around 4.5 hours), cost £50, and are the most fun you can possibly have with a dead mouse. 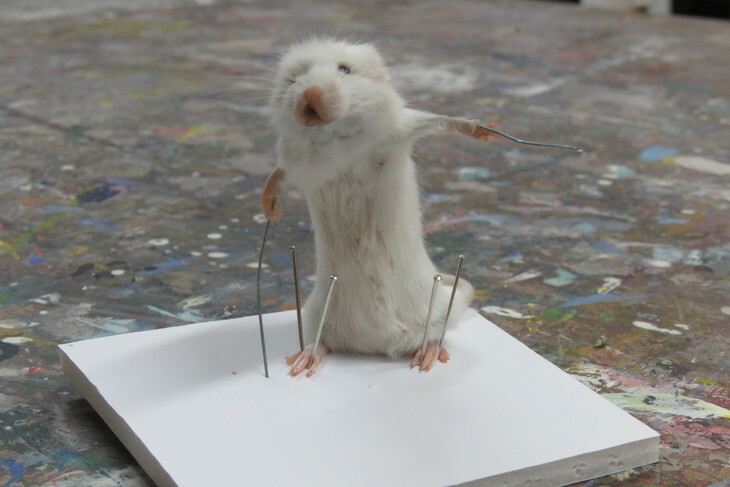 For more information check out the British Academy of Taxidermy website, which also has the funniest set of FAQs of any website I’ve seen. No animals are killed for the classes. All specimens are sourced responsibility and are the by products of the pest control or pet food industries.